Smartphone manufacturers are banking on its photography department to battle out their rivals. 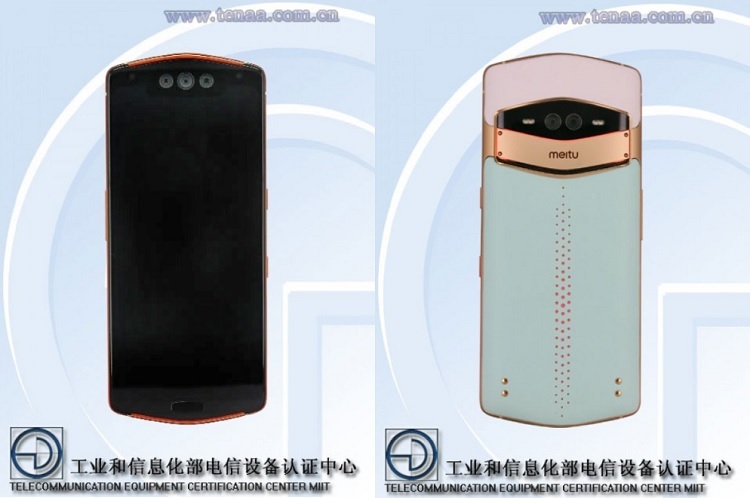 While almost all of the brands are putting their spotlights on its rear cameras, Meitu seemed to shift its focus on its selfie snapper – producing a device with triple front shooters. Meitu will launch its MP1801 smartphone soon. However, some of its key specs have already surfaced, thanks to TENAA. The Meitu MP1801 flaunts a V-shape design on its top that highlights its huge notch. The device is said to sports a 6.21-inch OLED display that gives off a 1080p+ resolution. Under the hood, the phone loads a hexa-core processor complemented with 8GB of RAM and up to 256GB of internal storage. Meanwhile, its key selling point is found on its camera section. The MP1801 is armed with triple lens for selfie – composed of 12-megapixel, 20-megapixel, and 8-megapixel sensors. TENAA, on the other hand, didn’t mention their functions, but we could expect that it has main, wide-angle and depth sensors. The device also has 12-megapixel + 8-megapixel dual rear cameras. Interestingly, it is mounted with unique LED flash setup. Meanwhile, in case you’re unfamiliar with Meitu, expect that the company will be more popular soon as Xiaomi partnered with them to take care of Meitu's upcoming hardware, R&D, production, and sales. Nevertheless, Meitu will still work on their camera software.